MCR Hotline products are an excellent choice for handling extreme heat. The Hotline series consists of gloves sleeves, and pads. The 9432GFR is 32 ounce extra heavy weight glove option. 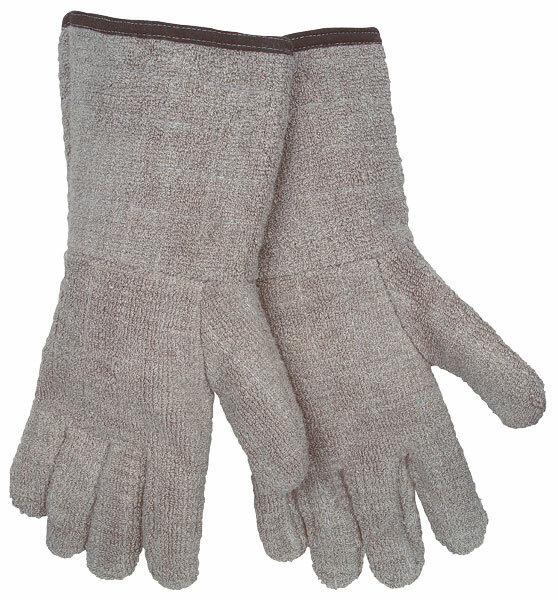 It is made of a brown and white loop out terry cloth material, has a 5" gauntlet cuff, inset thumb, and is fully quilted with a 10 oz jersey lining. Protects up to 450 degrees F. and is treated to be limited flammability. Extra heavy loop out terry material, 32 oz.